To access this website, you must be of legal drinking age assigned by your country&apos;s law. If there is no legal age for consuming alcohol, you must be over 21. I confirm being of legal age. You must accept the terms and conditions to enter this site. Alcohol abuse is dangerous for health, consume with moderation. 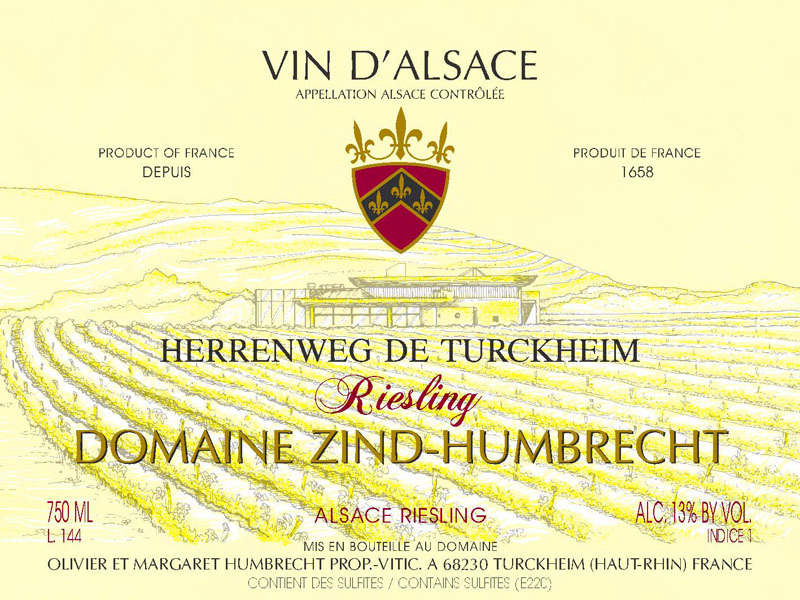 The cellars of domaine Zind-Humbrecht are located in the middle of the Herrenweg vineyard. Herrenweg means the ‘soldiers road’ in reference to the old romaine road that linked Colmar to the other side of the Vosges. The Herrenweg is our most precocious vineyard because it benefits from the Colmar specific climate (driest and warmest in Alsace) and also the soil, made of pebbles and fine sands, drains easily and therefore warms up very quickly. As temperatures at roots level are more influential on precocity than temperatures at leaves level, it explains why any grape variety on the estate is always harvested first in the Herrenweg. Specific canopy management and the use of some bio-dynamic preparations also help the vines to mature physiologically quicker. This is very important in vintages where alcohol levels can be too high, as we can harvest earlier with better acids. This is exactly what happened in 2010 with this Riesling. The grapes were fully ripe and we could harvest them at a moment where the acidity was still important. It seems like a contradiction but the numbers are there! 3/2012: the nose shows a surprising nice minerality for the Herrenweg, usually fruitier and simpler. The selection was stricter in 2010 and the proportion of older vines is more important. Yields are also very small! The palate has the structure of a tight limestone Riesling, with a crisp saline acidity. Low RS, so the finish is quite dry and long. Pity that this is a small cask as it is probably our best Herrenweg to date! Winegrowing is a passion that has been passed down from father to son in the Humbrecht family since the 17th century. Domaine Zind Humbrecht today comprises of 40 hectares of vines, spread out over an array of different terroirs in the geological patchwork which is the Alsatian wine region and birthplace of our noble grape varieties.